Franklin Monroe-MVCTC FFA chapter officers who competed in the Darke County Parliamentary Procedures contest were (l-r) Clem Montgomery, Garrison Warner, Jacob Winterrowd, Morgan Hissong, Elisabeth Williams and Makayla Knipp. 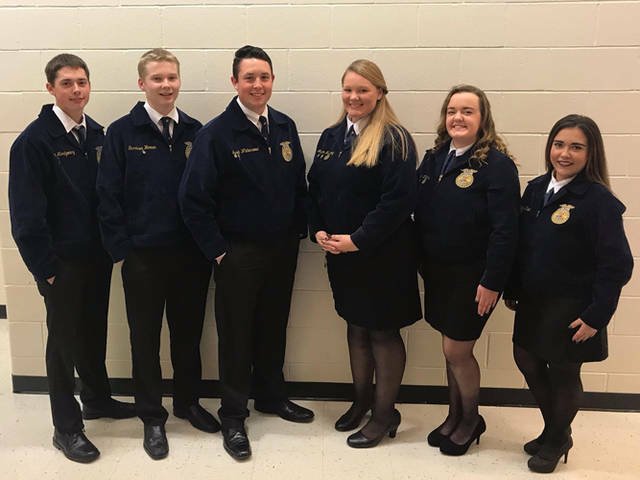 UNION CITY – Franklin Monroe-MVCTC FFA participated in the Darke County Parliamentary Procedures contest that was held on Nov. 26 at Mississinawa Valley High School. This contest tested the students’ ability to carry out a meeting properly. The group of six FFA members were given a specific meeting agenda and they had two minutes to prepare a meeting. After the preparation, the group presented their meeting in front of two qualified judges. These judges evaluated each of the presentations and scored them accordingly. After the judges scored all of the presentations, the winners were determined. The group was judged on its ability to properly carry out a meeting following Robert’s Rules of Order. All the students also were evaluated on their ability to discuss main motions and persuade their fellow FFA members to support their point of view. The Franklin Monroe-MVCTC FFA chapter officers put in many early morning hours preparing for this event. This effort paid off as the chapter competed against the other FFA chapters from Darke County and finished in third place. Franklin Monroe narrowly missed advancing to the District 5 contest. This event provided these students with the opportunity to learn more about how to properly run and participate in a business meeting. This is a skill that will be valuable as these young adults take on larger leadership roles in their home and community, officials said.